Special Deluxe Edition with DVD and 2 CDs. Music Sales America. 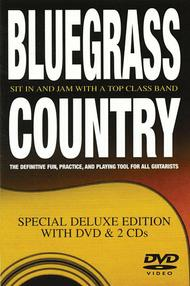 French Edition, Spanish Edition, Instruction, Bluegrass, Country Instruction. Music Sales #DV10054N. Published by Music Sales (HL.14004653). Have you ever wanted to jam with a top class band? Do you want to sharpen up your improvisation technique? 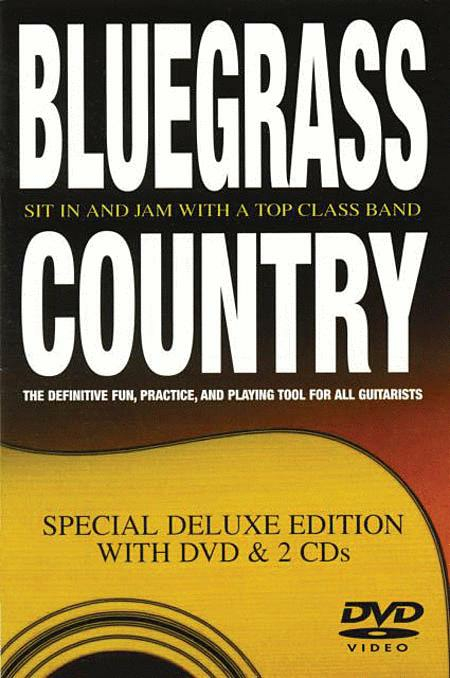 This DVD showcases renowned guitarist Richard Collins and his band demonstrating a variety of authentic bluegrass songs and showing you how to play them. It features step-by-step tutorials that show you exactly how to play, and you'll also learn about tuning, passing chords, lead runs & scales. Six full-length backing tracks are also included to let you practice with a top professional band. Bonus! Also included are two CDs featuring 13 bluegrass favorites, all recorded to make them sound as if the band is right there in the room with you! Each song has two tracks: one demonstrating the guitar solo, the other a full-length backing track that lets you take over the solo yourself! Authored for Zone 0. Languages: English, Spanish, French, German, Italian.